While waiting for my copy of Players Handbook to arrive, I’ve read through the basic rules of Dungeons & Dragons 5e. It seems to me that, all in all, the rules have lost some weight when compared to Pathfinder, which is very good. But, some aspects of the rules are still a bit chubby. Take the passage about Dropping to 0 Hit Points on page 76 of the PDF, for instance. Yeah, I read it and I just knew I’d have to come back and read it again as soon as the first PC drops, one hour into session number one. So, I went over it twice and distilled the essence into a flowchart-esque document. Feel free to share, print and use! 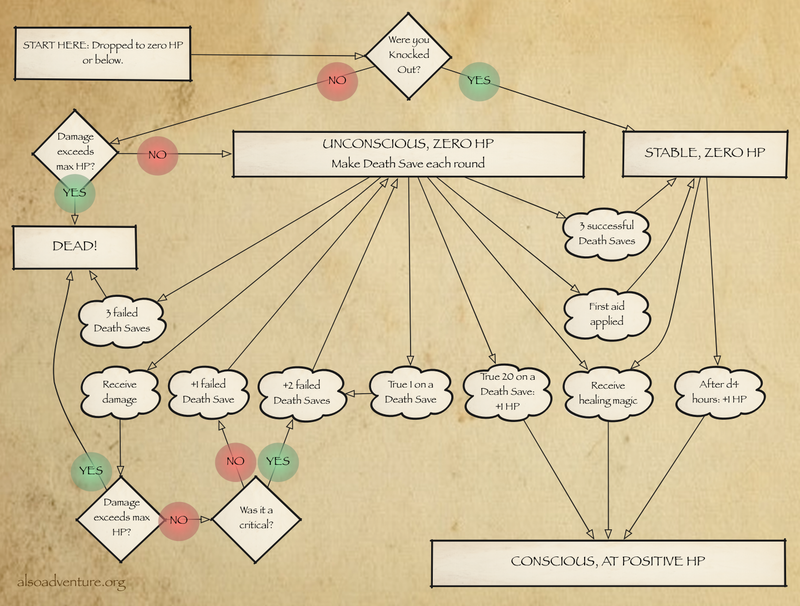 Thanks to the folks over in this thread (http://www.enworld.org/forum/showthread.php?359981-Dropping-to-zero-HP-flowchart-is-it-helpful) at enworld.org for helping me tweak the flowchart! Thats why I saw this on enworld.org. Good work dude very informative flowchart . Thanks for sharing!